The hysteria surrounding Ebola has grown so overwhelming I'm tempted to make a pun about the disease going "viral." (Forgive me.) Despite the fact that there have only been three confirmed cases in the U.S. so far, not to mention the government's adamant, incessant reassurance that an outbreak in the U.S. is highly unlikely, people are freaking out about Ebola. Humans, being humans, are taking their fears and running with it, occasionally stopping to send a tweet. Right now social media is rife with ridiculous reactions to the Ebola crisis, but if you're one of the sane ones, just sit back and take in the endless entertainment false chaos provides. From a GOP Representative in South Carolina warning that Hamas might deliberately infect themselves with Ebola to spread it in America to two strippers who placed themselves in voluntary quarantine after sitting next to Amber Vinson on her flight, our country is filled with paranoid people and conspiracy theorists. 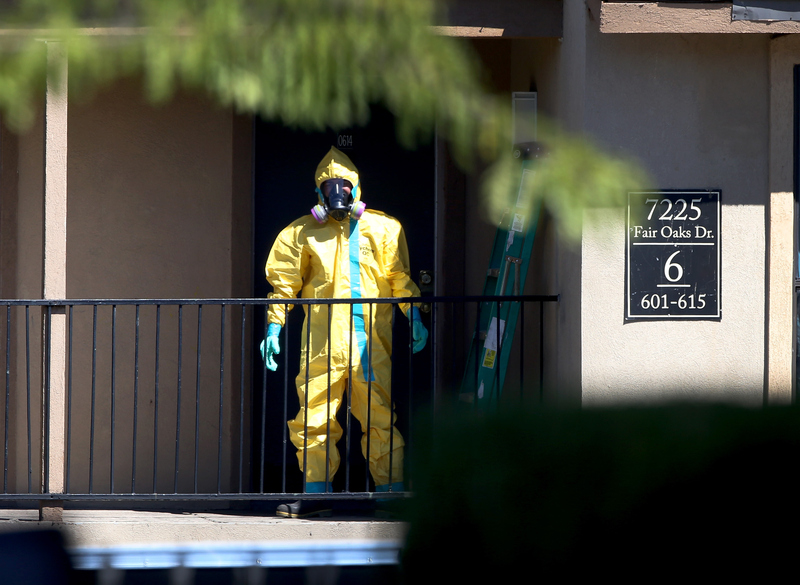 Ebola is currently providing them endless fodder for preposterous, groundless theorizing. But this kind of hysteria is translating into some very serious actions, like schools closing, Ebola-based discrimination, and cruel treatment on flights. 2. Basically, anytime someone vomits now, they'll be locked up somewhere involuntarily. 3. This person confessed their Ebola fears on Whisper, but I'm pretty sure that's not what that wall is for. 4. The human race is lucky to have this girl, who clearly has all the answers. 5. Chris Brown shares his insight on what Ebola really is. 6. Wow. This girl must be bummed. 8. And if you're still not convinced that all the Ebola hype has gotten to people's heads, here's a woman dressed in a full hazmat suit at Dulles airport.